Fish and wildlife officers use a variety of vehicles – 4x4 trucks, quads, skidoos, boats, helicopters, etc. – to patrol Alberta’s vast outdoors and backcountry as they perform their duties. Our training program for fish and wildlife officer recruits – the Western Conservation Law Enforcement Academy – is paid, comprehensive and designed for you. The program runs for 18 weeks and shares time between the Hinton Training Centre in Hinton and Alberta Justice and Solicitor General Training Academy in Edmonton. It’s led by instructors – mostly active officers – from across Western Canada who use innovative techniques to deliver a first-class learning experience. We give you a structured learning environment that gets you job-ready and instils the pride and professionalism that comes with being a fish and wildlife officer. During training, you must successfully complete the Physical Abilities Requirement Evaluation (PARE) test twice. After you successfully complete the Western Conservation Law Enforcement Academy training program, you’ll return to your district and work under a field training officer for 12 months. This gives you vital operational experience. When you submit your resume and requested documents through the Alberta Public Service Jobs website, we review them to make sure you meet – or will soon meet – the officer job requirements. 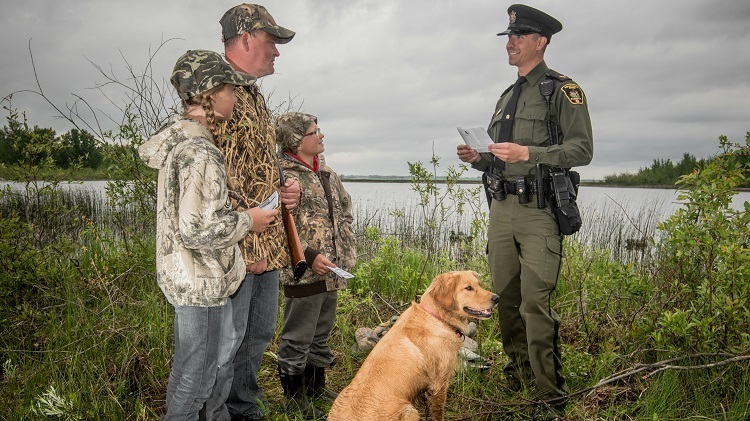 the PARE test is designed to evaluate your level of physical fitness to ensure you can perform the duties of a fish and wildlife officer. You must pay for the test; the Alberta government will reimburse you if you’re hired. The interview panel is made up of senior staff from the Fish and Wildlife Enforcement Branch and a human resources consultant. You must be willing to accept an assignment in any one of several districts located across the province. Be ready to discuss which of our 50-plus districts you prefer. In-person interviews are required; however, exceptions may be made for applicants who live outside Alberta. We check your references and verify your academic credentials. You’re required to take a pre-employment psychological assessment, arranged by and paid for by the Alberta government. We conduct a detailed background check that examines your personal and professional life. Thank you for your interest in becoming an Alberta fish and wildlife officer. To prepare for our next competition, make sure you meet – or will soon meet – the officer job requirements. Fish and Wildlife Enforcement offices are open 8:15 am to 4:30 pm (Monday to Friday, closed statutory holidays).